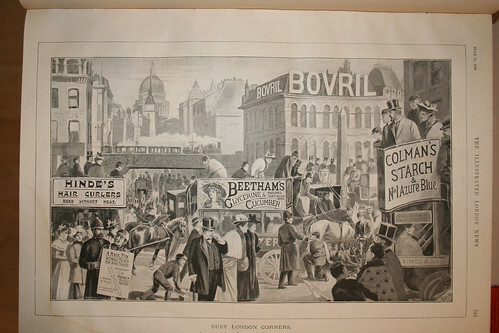 Taken from a June 1896 issue of the Illustrated London News, this is one of a series of “scenes of London” – this of Ludgate Circus. Notable though is the railway bridge and steam train belonging to the Chatham and South Eastern Railway. This was replaced with an underground tunnel in 1990 and is now the Thameslink line, with City Thameslink being the the left hand side of the road the bridge is going over. Incidentally, had the Fleet Line of the London Underground been built, it would have had a station at Ludgate Circus. Of all the eyesores of modern London, surely the most hideous is the Ludgate Hill Viaduct – that enormous flat iron that lies across the chest of Ludgate Hill like a bar of metal on the breast of a wretch in a torture-chamber. Let us hope that a time will come when all designs for City improvements will be compelled to endure the scrutiny and win the approval of a committee of taste. The useful and the beautiful must not for ever be divorced. The railway bridge lies flat across the street, only eighteen feet above the roadway, and is a miracle of clumsy and stubborn ugliness, entirely spoiling the approach to one of the finest buildings in London. The five girders of wrought iron cross the street, here only forty-two feet wide, and the span is sixty feet, in order to allow of future enlargement of the street. Absurd lattice-work, decorative brackets, bronze armorial medallions, and gas lanterns and standards, form a combination that only the unsettled and imitative art of the ruthless nineteenth century could have put together. Think of what the Egyptians in the times of the Pharaohs did with granite! and observe what we Englishmen of the present day do with iron. Observe this vulgar daubing of brown paint and barbaric gilding, and think of what the Moors did with colour in the courts of the Alhambra! The stolid hammermen went to work, and the iron nightmare was set up in all its Babylonian hideousness. ‹ Merry Christmas and a Happy New Year?